We understand that applying for a loan can be quite a daunting thing. Especially if it’s not something you have done before. Loans are really only something that you apply for in a time of need. This means that you’re already feeling the stress going into the process. Therefore, the idea of adding even more stress to your situation can be quite off-putting. Signing a loan contract is likely to be the most stressful part of the application process. Therefore, the idea that it is a legally binding document can cause some people to run a little hot. This may have you sitting in front of your loan contract not having a clue what anything means. Well, don’t worry. You’re definitely not alone in your confusion. As responsible lenders, we want to make sure that our clients feel confident and comfortable throughout the entire application process. Right up until they’re loan has been paid off. Therefore, we have put together a few tips on what to look out for in a loan contract. Our aim is to put your minds at ease when you’re applying for a Jacaranda loan. Being in a situation where you need quick cash is stressful enough. Especially without feeling like a fish out of water when going over all the paperwork. We’re in the business of helping people, not making them more panicked. Keep reading and find out how simple, fast and stress-free our application process is. What is a loan contract? A loan contract is a legally binding agreement between the lender and the borrower that outlines the loan process. There are several types of loan contracts. Both state and federal guidelines govern each type of contract. Loan contracts are there to help to prevent illegal or excessive interest rate repayment. The main purpose of a loan contract is to define what the parties involved are agreeing to. It also defines what responsibilities they have and for how long the agreement will last. It is important to establish these aspects in the loan contract. This is to ensure the reliability of the agreement. A loan contract should be in compliance with state and federal regulations. These are in place to protect both the lender and the borrower if either party fails to honour the agreement. All loan contracts should clearly define the reason for the loan as well as the amount of the loan. This ensures that the lender and the borrower make a commitment to each other. Both parties are to agree that the funds are for a particular purpose. Furthermore, the borrower will pay back the loan in a specific matter and that the interest rates stay the same. If the money is then put towards a different purpose, that was not written in the loan contract, the borrower should pay back the money immediately. Why is a loan contract important? Taking out a loan is a huge financial commitment. It can leave both the lender and the borrower in a rather vulnerable position. Therefore, it is very important that a formal process is in place. This is in order to protect both sides and produce a positive outcome. It is also important to outline the amount of money borrowed, interest charges, repayment plan, collateral, late fees and penalties for defaults in the loan contract. This is just to make sure that nothing in the initial agreement can be taken out or altered. Confused about collateral? Find out how collateral loans work here. A loan contract also proves that the money is meant as a loan and not a gift. Therefore, the borrower repay the funds and there are to be no appeals against the terms and conditions of the loan. A loan contract protects both the borrower and the lender if the matter reaches court for any reason. If this is the case, the contract helps determine if the terms and conditions in the agreement were being met. This just means that if there is a prosecution, it will happen in the fairest manner possible. 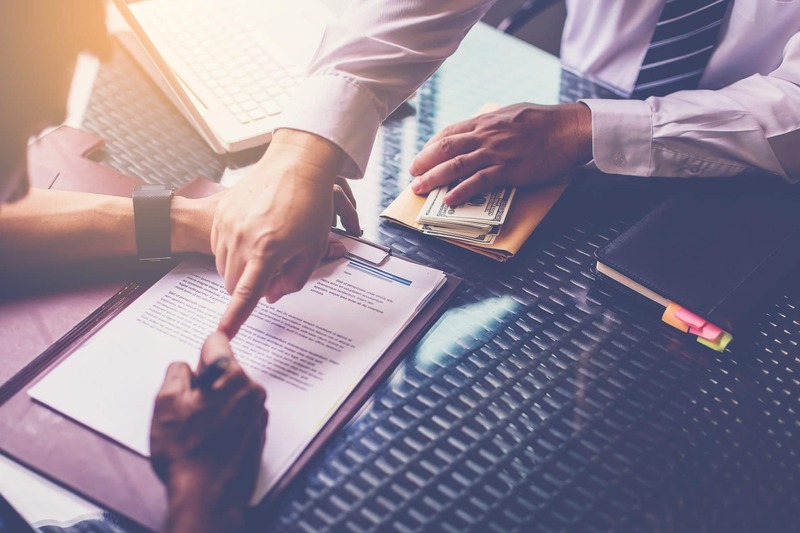 If you apply for a loan through a company and a legitimate loan contract is not included in the process then you should cut your association with that company immediately and report them to the Australian Securities and Investments Commission. When you go over your loan contract, it is important to read every word on the page. This is to ensure that you don’t skip over anything and it prevents the chance that nasty surprises will pop up in the term of the loan. So, as tedious it made be reading over pages and pages of financial and legal jargon, it will help protect you from extreme vulnerability throughout the agreement. – It is important to understand the provisions in the loan payment agreement. This will help you identify your responsibilities and possibly the levels of risks you assume by accepting the loan terms. – This section will basically just outline the loan provider’s responsible lending obligations. It is important to take note of this in order to know what responsible lending look likes. – In order to receive approval on your loan application, it will require you to provide information on your income and expenditure that supports your ability to pay back the loan. It is important that you ensure that all the information you provide is completely honest and accurate. – This provides you with a breakdown of all the fees and expenses associated with your loan. It will outline the establishment fee and monthly fee as well as the details of your repayment agreement including the amount to paid and at what intervals you are to pay that amount. The dishonour fee that is charged for missed or late payments is found in this table. The direct debit cancellation fee that the lender will charge if you stop your payments without first notifying the lender will also be shown. – You should go through and double check that all of the information you have provided is correct. You should point out any spelling mistakes or typos of your personal details to all parties in the loan contract. This is especially important when to your bank details and your contact information. If there is a mistake in either of those sections, you risk the lender sending the money to the incorrect account. Otherwise, the loan offer may expire if the contract is sent to the incorrect email address. Using gmail? Here are some tips on us. It is important to never feel pressured when it comes to signing your loan contract. Once your application is approved, the contract will be sent to you. It is completely up to you when you want to return it. Just keep in mind that the longer you take to send back the loan contract, the longer it will take for you to receive your money. You could also risk the loan offer expiring if you hold on to the contract for too long. Generally, a personal loan contract is signed and returned the same day it is sent out. However, if you’d like to take some time to come to terms with the full content of the contract, you should absolutely do so. If you have any reservations about some of the terms outlined in the loan contract or you have some further questions you’d like answered before signing then you should call the lender directly. It is important that you feel 100% confident in the loan agreement before signing it. Make sure you keep a copy of your signed contract for your own records. If you don’t receive a copy of the signed loan contract then it’s possible that the lender didn’t get one either so you should always chase that up. The last thing you want is a technical glitch unravelling your entire agreement so check everything once and then check it a second time just to be sure. As mentioned before, in the financial table you’ll find your default penalty interest listed. This basically means that if a default occurs at any time throughout your loan agreement, the lender will charge a penalty fee. An example of a default is if you place a direct debit ‘stop payment’ or cancellation of your loan repayments with no warning. Doing this could result in your receiving a $123 direct debit cancellation fee. This type of charge is completely unnecessary and avoidable. If it so happens that you are unable to make a payment, you should get in touch with the lender immediately instead of taking action of your own. It is likely that the lender will be able to work with you to come up with alternative payment arrangements that suit to your situation. Annual Percentage Rate (APR) – This is the interest rate that is the lender charges on a loan. It is reflected as a yearly percentage. This rate includes any fees or additional costs associated with the loan. It is a useful figure in helping borrowers compare the costs of different loans. Establishment fee – The lender charges this fee when they deposit the money into your nominated account. If they do not charge an establishment fee, you may end up paying higher ongoing fees instead of the smaller upfront one. Default – The lender will record a default if you do not meet your obligations when it comes to the terms of repayment. It could mean that you’ve missed a payment, made a late payment or are avoiding payment altogether. A default on your loan will result in default penalty interest and could leave a black mark on your credit report. Dishonour fee – The lender will also charge a dishonour fee as a result of a default. If any of the above-listed defaults occur, they will be charge a certain amount on top of your original loan payments. Amount of credit – This refers to the amount which the lender lends to the borrower as stated in the financial table. Direct debit authority – This refers to the direct debit request and authority form signed by you authorising the lender to directly debit your bank account. Enforcement expenses – These are all reasonable expenses incurred by the lender in enforcing the loan contract when you are in default. Settlement date – This is the day on which the lender accepts the borrowers offer on the terms of the loan contract. Outstanding balance – This means the running balance of the loan account at any time. It is comprised of the difference between all amounts credited to the loans account and all amounts debited to the loan account at the same time. What To Look Out For in a Loan Contract Overall rating: 4.8 out of 5 based on 60 reviews.